This pre-owned Estate necklace is crafted in solid 18K yellow gold. You will be the epitome of classic understated elegance with this mythological Pegasus surrounded by a classic wheat pattern in solid gold. 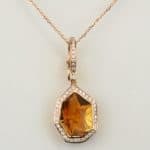 The pendant is adorned with the subtle touch of a small diamond on top and a smooth cabochon pink tourmaline on the bottom. The pendant is suspended from a gorgeous removable gold mesh collar. The length usually falls around the collar bone and would look great with your favorite scoop neck or button-down collared shirt as well as that classic cocktail dress.